Almost 10.7 million South African homes, out of a population total of 55.5 million, own a television (TV) set. Traditionally, the TV is the first thing you see when walking into most living rooms. It sits there like a king taking its rightful place on a throne, in what is essentially meant to be a space which is aesthetically expressive of your personal tastes and interests, which are reflected in every piece of furniture, every work of art on the wall and every ornamentation object. Whether large or small, the TV should be no exception to this rule, and as visitors to Decorex Johannesburg 2017 recently found out, the days of it boasting a strong visual presence as a black square taking up valuable wall space once its switched off are numbered. 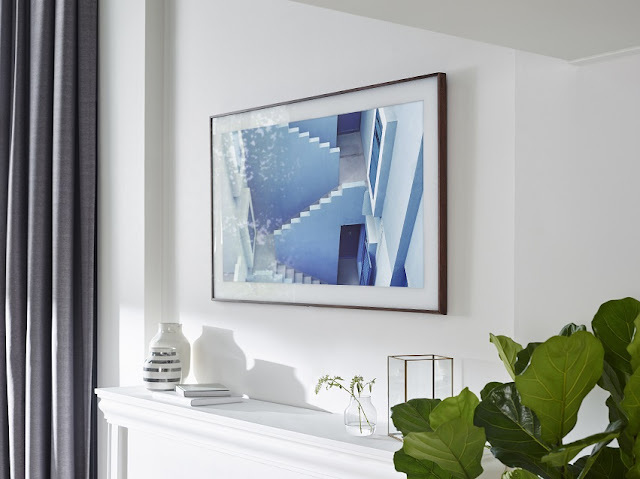 Market leaders in cutting edge innovations which are tailored to challenge norms and enrich people’s lives through fulfilling needs and desires, Samsung, continues to wow South African audiences as it officially unveils The Frame TV to the local market. In regular TV mode, this device is a majestic and bold 4K UHD TV, but turn it off and it enters Art Mode and becomes an elegant picture frame for stunning gallery-quality art and showcases great family moments through photographs. The illusion of The Frame TV being a regular artwork is achieved because it sits flat to the wall, thanks to the no gap wall mount matched by a recessed area on the back of the TV. This is partly possible because there it has no HDMI or other connectors on the back of the screen, only a thin power cable and a bespoke connector to a thin optical cable, which is almost 'invisible'. This links the TV to a box where the regular cable connections are found. This exclusive, professionally-curated Samsung Collection includes 100 works of art from 37 famous artists across 10 genres which include photography, paintings, drawings, and digital works. What’s more, a visit to the online Art Store allows viewing and purchasing of internationally famous artists, either on a permanent or monthly basis to ensure each personal art collection stays fresh. It also has a number of bezel frame options, so whether it’s a Picasso or a family photograph, the right frame can be chosen to match. But it’s not just the discreet design that makes The Frame an innovative entertainment tool. When not displaying your favourite art or photos, The Frame TV offers exceptional picture quality boasting 4K Ultra HD resolution, 4K HDR, and over 1 billion colours, so you get both beautiful art and a beautiful television. Further, forget multiple remotes all over the place as with Samsung’s OneRemote you can control all your favourite shows, works of art and connected devices without requiring setup. “To experience the future of TV today as well as the many wonderful features of The Frame TV which led to it winning the ‘Best of Innovation’ Award at CES this year, make your way to Decorex Johannesburg which runs from 9 to 13 August 2017. It’s sure to put you in a new frame of mind about television forever,” concludes Hume.